Incorporated in 1997 in the UK to develop Imaging and PDF format related software, Tracker Software Products has offices in Canada and the UK, with additional development offices in the USA and Ukraine. Our corporate headquarters relocated to Vancouver Island, Canada in 2008. The main thrust of our products are Document / Imaging related applications and developer toolkits. Our PDF products fully conform to the PDF specifications as originally defined and extended by Adobe and now maintained and set by the International Standards Organization (ISO) - any PDF file created or manipulated by any of our products is fully compatible with any application that also conforms to the official PDF specification and generates equally compatible files as defined by these standards and vice versa! In addition, you will find our best selling PDF-XChange 7, TIFF-XChange, Raster-XChange and Image-XChange software at the heart of 1000's of other software products from other Software Publishers world wide - providing PDF, Imaging and TIFF file generation and output - we license our technology to many 1000's of other software developers, large and small, including ABBYY, Hewlett Packard, Mindjet, Sage and many many more. We are proud to number amongst our Clients some of the worlds largest companies - but rest assured all of our clients both large and small are equally important to us. Please observe the list of our existing Clients here. Why you should consider using our software products in preference to any other? You want to use the same reliable, 'Industrial' strength PDF/Imaging technologies relied upon by 1000's of Software Companies worldwide - not open source products created and/or maintained by non professionals and amateur enthusiasts. You need a FREE PDF viewer with advanced functionality and speed - but developed and supported by industry professionals! You need prompt and reliable support - free of charge to all users - both paying and users of our free products. You are a software developer looking for comprehensive PDF or Imaging solutions without excessive Royalty Fee's and from a supplier who will include you in future development options. 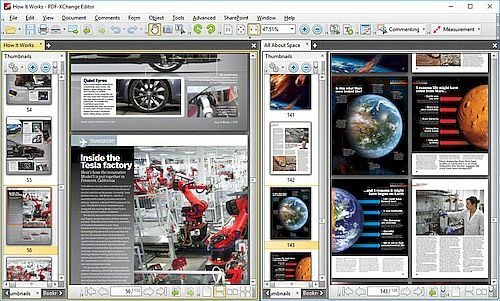 The smallest, fastest, most feature-rich FREE PDF editor/viewer available! Create, View, Edit, Annotate, OCR and Digitally Sign PDF files plus much more..
Editor Plus license includes ability to Create and Edit fillable forms. Includes PDF-XChange 7 Lite printer. Simply put: the smallest, fastest, most feature-rich PDF software available. Create, view, edit, annotate, OCR and sign PDF files – and that’s just the beginning. If you work with PDF then this fully-customizable product will optimize your work process to levels that no other product can achieve. PDF-XChange 7 Editor can be used to create PDF files from scanned documents, images, text files, Markdown files and much more. This software can also be used to convert Microsoft Office documents – a feature that many PDF applications do not offer. There are over thirty tools available to assist in the creation of document comments, annotations and links. These tools make editing PDFs a finely-tuned, precise process that produces documentation and image files of the highest quality. Our user-friendly functionality is diverse enough to meet the needs of all practitioners from novices to professionals. Tracker Software is proud to announce that PDF-XChange 7 Editor was released on 01/12/2017. 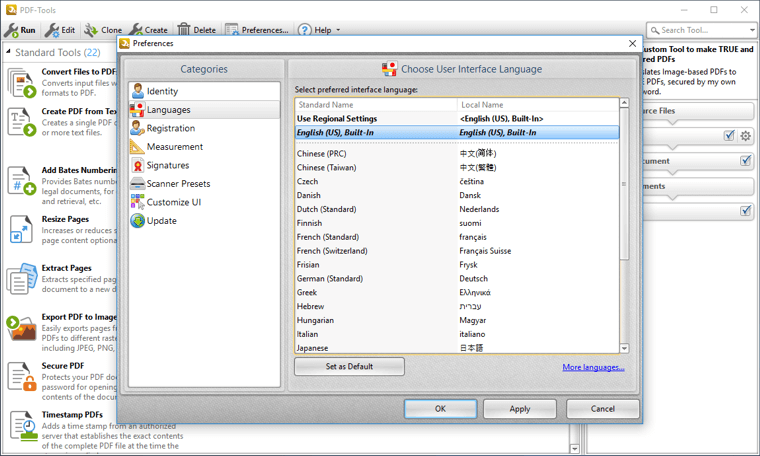 The latest build includes a dynamic and fully-customizable Ribbon UI, autosave/autorecover options, a wide range of new editing features, MRC (Mixed Raster Content) support, new compression and OCR features, two new form options, expanded Snapshot and Select Text Tools, development of date macros and support of TWAIN 32-bit scanners in 64-bit environments. Please see below for an extensive list of all available features and functionality. Supported Operating Systems: PDF-XChange 7 Editor supports all Windows (32/64 bit) operating systems from Windows XP and later. Do you need to convert MS Office files into PDF format? Do you need a virtual printer to print/convert/preview documents? Do you need to create PDF files that combine image quality with space efficiency and superb data retention – even at high levels of compression? If the answer to any of these questions is yes then this is the product for you. Tracker Software’s best-selling virtual printer, PDF-XChange 7 Standard, is the ultimate application for the creation and virtual printing of industry-standard PDF files. It’s compatible with files from almost all Windows applications, such as Word, Excel and AutoCAD, and features an optimized engine for superb conversion of images and image-based text characters. The files it creates are surprisingly small, given their quality – allowing for faster uploads/downloads, a reduction in storage space and increased data retention. PDF-XChange 7 Standard also features MS Office integration, which provides extra functionality such as adding clickable tables of contents and embedded URL support that facilitates the creation of external links. Batch conversion is also supported, making it possible to convert multiple MS Office files simultaneously into PDF documents. Tracker Software is proud to announce that PDF-XChange 7 Standard was released on 01/12/2017. Version seven features a hybrid conversion engine that can print to both GPI and XPS. Driver Mode Rules have also been introduced, which enable the designation of GPI/XPS printing for specific printing applications as desired. MRC (Mixed Raster Content) is now also supported. Please see below for an extensive list of all available features and functionality. Virtual printers generate fully-compatible, industry-standard, native PDF files (as opposed to paper versions of documents). When suitable source material is used these documents feature searchable text, which greatly increases the efficiency of searching, selecting and editing files. PDF-XChange 7 Standard features a wide range of functionality and customizable options to enhance, update and secure PDF files - please see below for an extensive list. Supported Operating Systems: PDF-XChange 7 Standard supports all Windows (32/64 bit) operating systems from Windows XP and later. All the features of PDF-XChange 7 Standard + PDF-Tools + PDF-XChange 7 Editor Plus, included in one economical bundle. 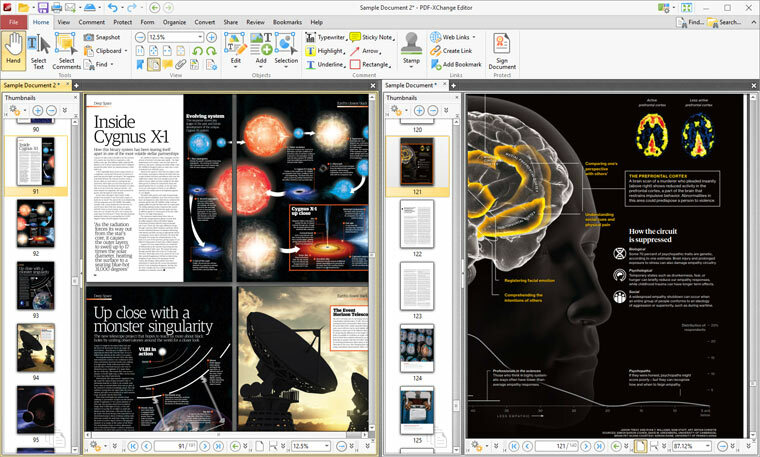 PDF-XChange 7 Editor Plus is a hugely dynamic and fully-customizable PDF application. Create, view, edit, annotate, OCR and sign PDF files – and that’s just the beginning. If you work with PDF then this fully-customizable product will optimize your work process to levels that no other product can achieve. Create PDF files from scanned documents, images, text files, Markdown files and much more. Open, edit and convert Microsoft Office documents. Avail of over thirty tools to assist in the creation of document comments, annotations, links and fillable forms. These tools make editing PDFs a finely-tuned, precise process that produces documentation and image files of the highest quality. Our user-friendly functionality is diverse enough to meet the needs of all practitioners from novices to professionals. PDF-Tools 7 is a worldwide leader in the creation and manipulation of PDF and image files. Highly user-friendly, it can be used to convert files of almost any format to/from PDF. Avail of fifty-one built-in standard tools, as well as functionality to clone and edit these tools and their variables as you desire. Use the Actions Library to fully customize your tools and the Tool Actions Sequence to determine the order in which they perform operations. Combine fifty-five available actions to create your own tools - out of billions of possibilities. PDF-Tools is compatible with large PDF files and can also handle a huge number of files simultaneously – batch conversion is its strength. PDF-XChange 7 Standard is Tracker Software’s best-selling virtual printer - the ultimate application for the creation and virtual printing of industry-standard PDF files. It’s compatible with files from almost all Windows applications, such as Word, Excel and AutoCAD, and features an optimized engine for superb conversion of images and image-based text characters. The files it creates are surprisingly small, given their quality – allowing for faster uploads/downloads, a reduction in storage space and increased data retention - even at high levels of compression. PDF-XChange 7 Standard also features MS Office integration, which provides extra functionality such as adding clickable tables of contents and embedded URL support that facilitates the creation of external links. What do you get when you combine three applications of such functionality and potential into one package? The answer is simple: unbeatable power at an unbeatable price. See below for further information on the features and functionality of each product. Version seven includes a dynamic and fully-customizable Ribbon UI, autosave/autorecover options, a wide range of new editing features, new compression and OCR features, improved date macros, two new form options and expansion of the Snapshot and Select Text Tools. 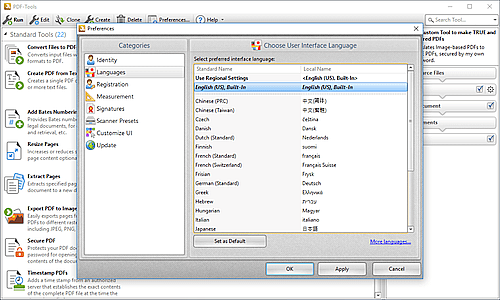 Version seven includes nineteen new tools, thirteen new actions in the Actions Library, the Watch Folders feature, which monitors folders and performs tool operations on files moved into them, the Tool Report feature, which provides a step-by-step breakdown of tool operations - and a host of additional features and improvements, such as expanded OCR options and input files recall, which remembers the files used for tool operations in order to speed up the process if the same group of files are used with many tool operations. Version seven features a hybrid conversion engine that can print to both GPI and XPS - which can be decided from within the application used for printing. Additionally, all of our products now support MRC (Mixed Raster Content) and the use of TWAIN 32-bit scanners in 64-bit environments. Supported Operating Systems: PDF-XChange 7 PRO supports all Windows (32/64 bit) operating systems from Windows XP and later.